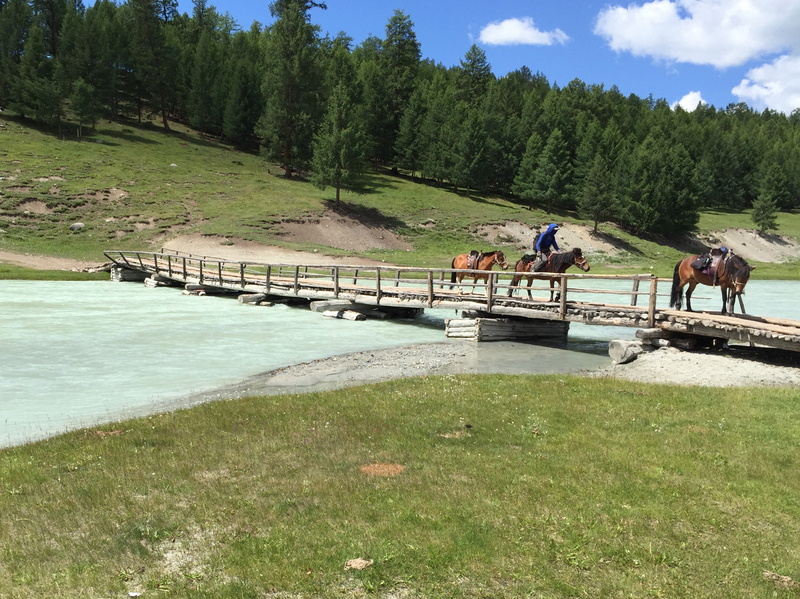 July 7-21, 2016 – I went on a multi-day horseback ride in the Altai Tavan Bogd National Park in remote western Mongolia. We passed close by the Chinese/Russian border and stayed a night at the base camp of the highest mountain in Mongolia, Khüiten Peak (4,374m/14,350 ft.). Travel Begins: I dedicated myself to 6 months of horseback riding lessons in preparation for this trip. Through a recommendation from a friend I took lessons at Friendship Stables. I had 2 wonderful instructors and made new friends, human and horse! Working with the horses has been great. 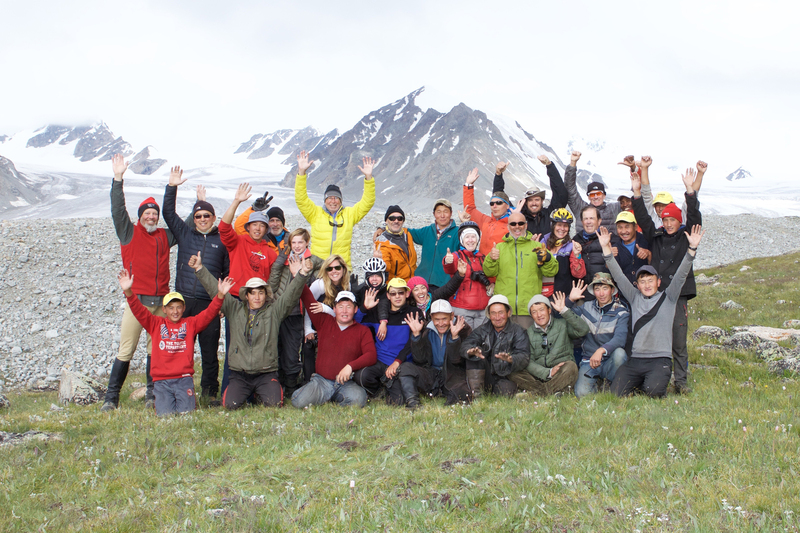 I told my instructor my goal… I want to be able to gallop across the grasslands of Mongolia. 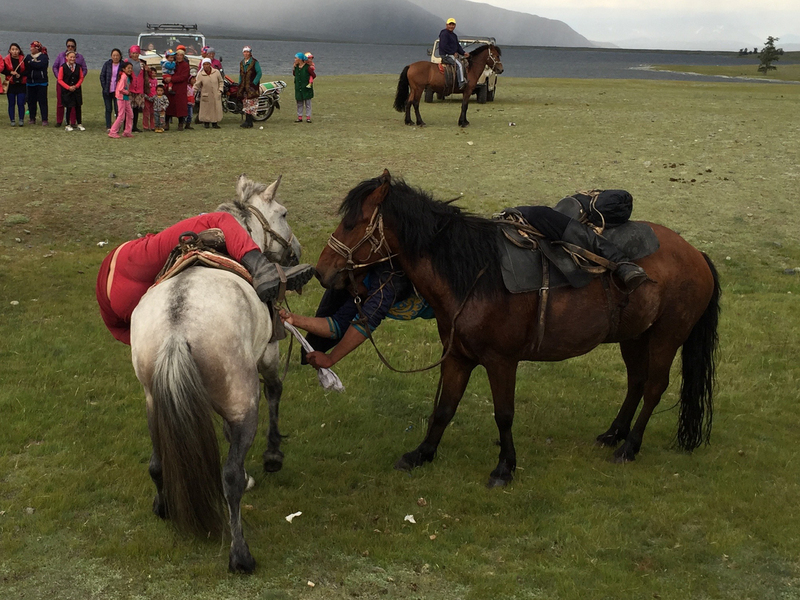 I met my goal and galloped in Mongolia! Guide Service: Tusker Trail. What an amazing guide service. This is my third trip with them. They are top notch. Thank you Tusker for another amazing journey. 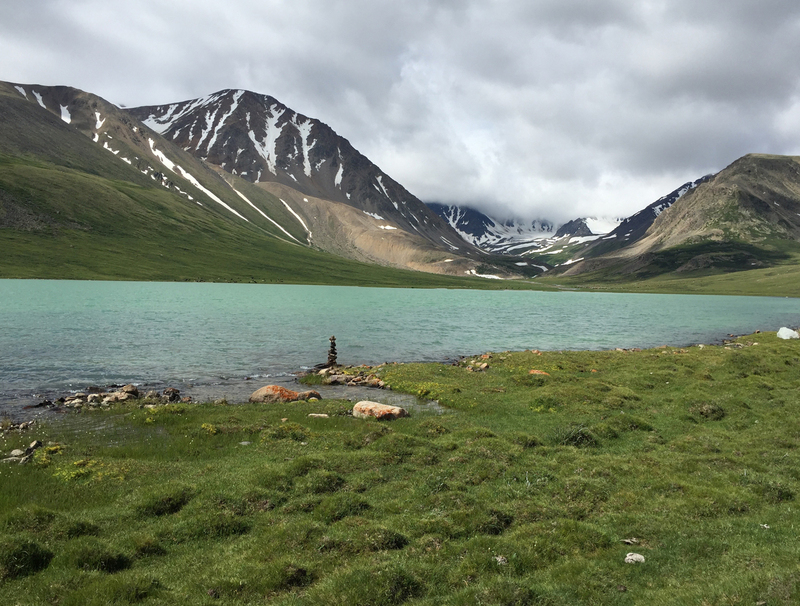 Day 1 – Sunday, July 10, 2016: We are finally there, at Khoton Lake for our first night of camping on the horse riding part of the adventure here. 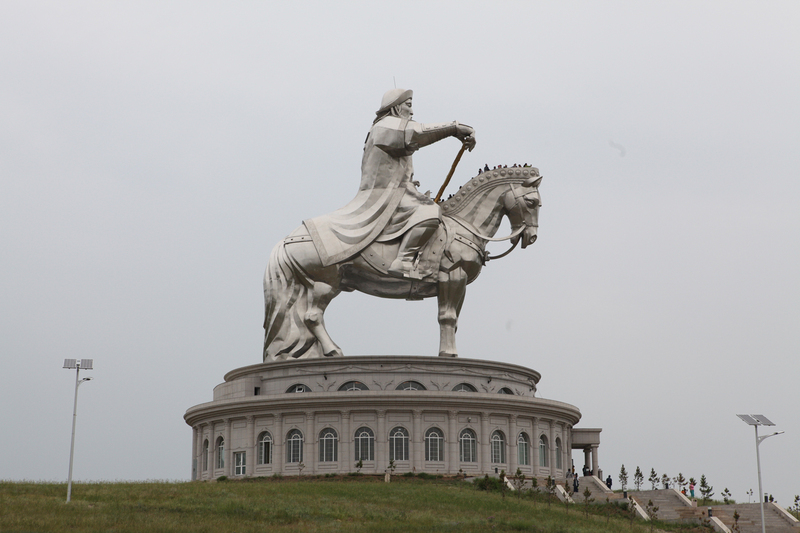 We spent a couple days in UlaanBaatar first visiting the Chinggis Khaan statue and the National History Museum. Then we flew to Ulgii and stayed 1 night in a ger camp. Today we work, packed our gear into Land Cruisers and began the all day drive to this remote location. The drive was an adventure all to itself. The vehicle I was in got bogged in the mud on a river crossing. After towing it out we got stuck again. We towed out again only to find ourselves reversed deeper into the river, so deep we started taking on a little water. We were towed out a third time, this time we went all the way out back to where we began. Before being completely towed out I opened my car door and the water inside went gushing out. After all the excitement we cross the river at a different place and continued on the 4×4 journey to this first camp on the lake. Oh, fun to note, earlier in the drive our vehicle had to stop for a smoking brake. That cooled, the crew made adjustments and we were on our way. Here at camp we met up with Mel who has been preparing for our arrival. She was my Bhutan guide. After a wonderful spaghetti dinner and interesting use of our trough style thrones, I’ve setup for sleeping. There is the occasional screech of a kite (like a falcon) and whinny of a horse in the distance. Before I sleep a couple other amazing things happened today. 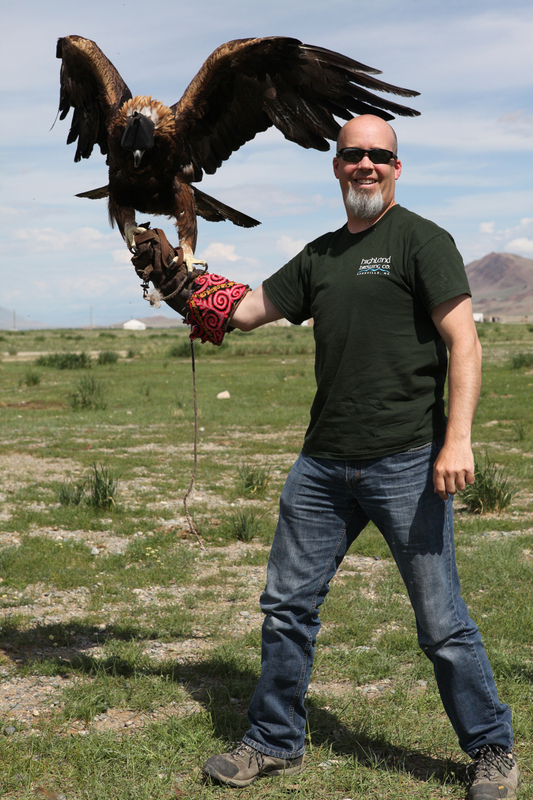 I got to hold one of the eagles used for hunting!! We also drove by 2 herd of wild camels, the 2 hump kind. Tomorrow we meet our horse for the first time and go for a short acquaintance ride. I can’t wait! I woke up at 3:15am and the stars were out! I’ve setup and pics are in progress. However, I don’t believe I’ll have a long session because it is 3:45 now and I”m fairly sure dawn is starting to break already. I quit at 4am, dawn is coming! I took 1 shot of dawn for fun. Also, dawn is coming from NE and if I want a star spiral, N needs to be in the frame, so that means 2am alarm if I want to go for that. Now back to sleep. Milky Way (facing SSW) at Khoton Lake; there are 3 meteors if you can find them. 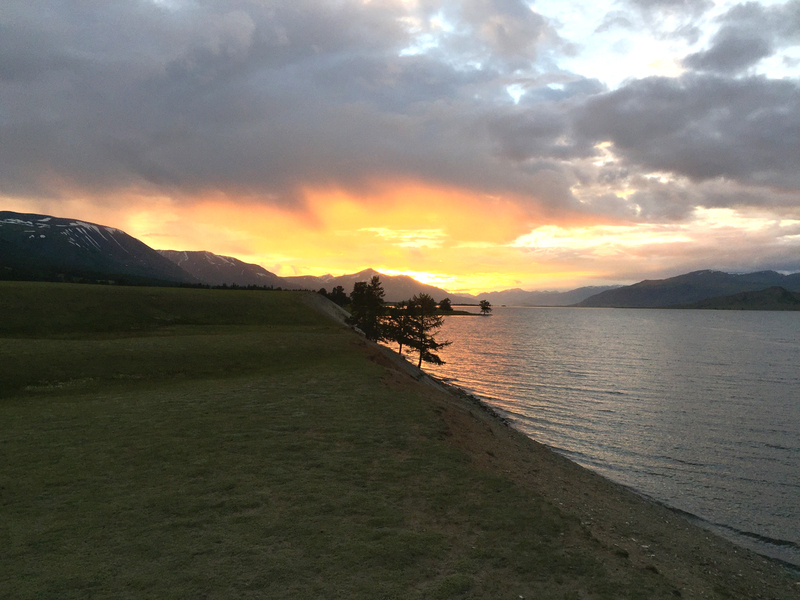 Day 2 – Monday, July 11, 2016: Today was a relaxing day by the lake. Midmorning we got to meet the horse we’ll ride for the next 8 days. Today we set out on a short ride to get a feel for the horse assigned to us and the Australian saddles. They are fairly comfortable; the parts in the front are different than English or western saddles. The horses are indeed small. We rode about 1.5 hours. After lunch we headed out again (about half of us) for another 45 minute ride. The trot/gait on these horses is really great. My guy takes a lot of encouragement to get into a cantor. It is easy to ride. The evening was filled with some Mongolian horse games. 1) Pick up the object from the ground riding by as fast as you can. 2) Tug of war with a rice sack between two riders. 3) The 1 year olds did a quick sprint race. 4) The big 5 lap race. Tusker gave prize money to the winners of each event. We have an amazing sunset, wow! We also experienced the inside of a Kazakh ger. Day 3 – Tuesday, July 12, 2016: What a fun day today! Our total travel time was 6 hours from camp to camp with about a 1 hour lunch. So 5 hours in the saddle and almost 13 miles later makes that my longest ride so far. We do have at least 1 more day to come that I know will be longer and I can’t wait! Pam is here from Bhutan trek with her daughter Juliet. JJ is a lot of fun. She is 12 and has been riding more than 5 years. We crossed quite a few rivers today of which 2 were very noticeable and strong. I had to jack my feet up behind me to keep them dry. As I settle in for the night we have the whinny of horses and rumbling thunder from 3 surrounding storms to put us to sleep. Tomorrow is said to be a shorter ride. I did not feel any tenderness in my inner thighs until now. Many more days of riding to go! Day 4 – Wednesday, July 13, 2016: So much fun today! I used a Mongolian whip on my horse today which is their version of a crop. I no longer had any trouble getting him to cantor and gallop! These Australian saddles are awesome! I feel very comfortable and stable at all speeds so far. By the way, Mongolian/Kazakh horses do not have names. It is brown horse, tan horse, spotted horse, etc. These are not the Russian Przewalski’s horses, they are Mongolian/Kazakh horses. They are very sturdy and work hard. They eat nothing but grass. An apple slice will get spit out. They have never seen apples before. We rode a little over 9 miles today and passed by a couple burial mounds from the 5th century. One more thing about my horse, I have to make sure I’m far away from the herd or no matter how hard I pull, he’ll turn right into the middle of the herd in his cantor. First gallop today! 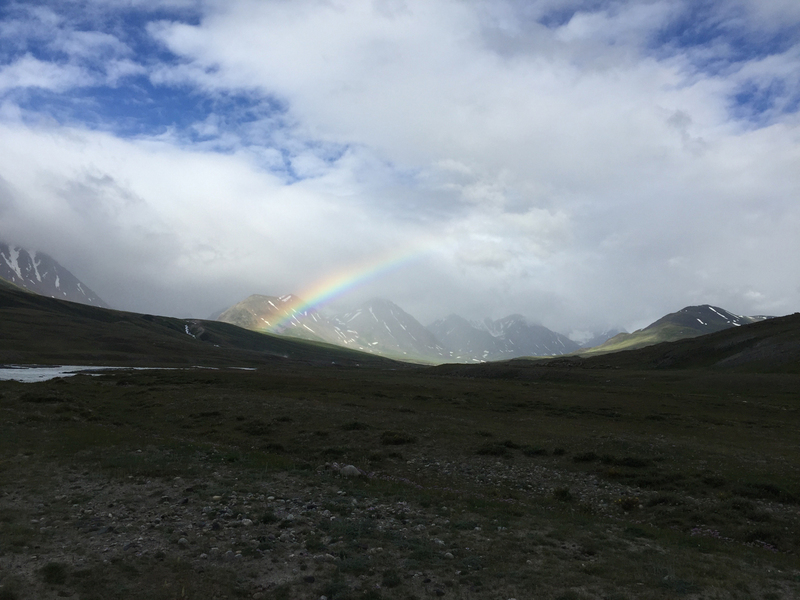 Day 5 – Thursday, July 14, 2016: We continued N today along the Chinese border. Our ride started out fairly in the open fields and my horse and I had a few good cantors and a nice gallop. What a blast! 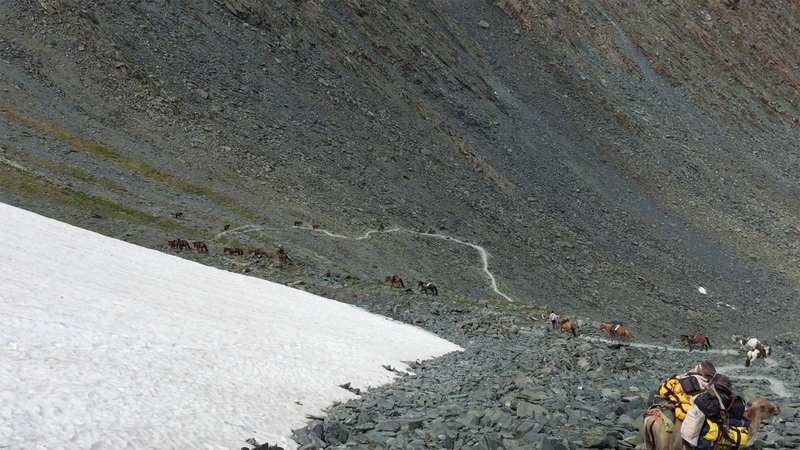 Most of the day was a single train of horses into the deep valley of the Altai on rocky steep trail. We followed the (glacial melt) river up the valley to the camp covering a little over 13 miles today, definitely my longest ride. I believe we have 1 more day that will be longer. I got to ride a camel today! 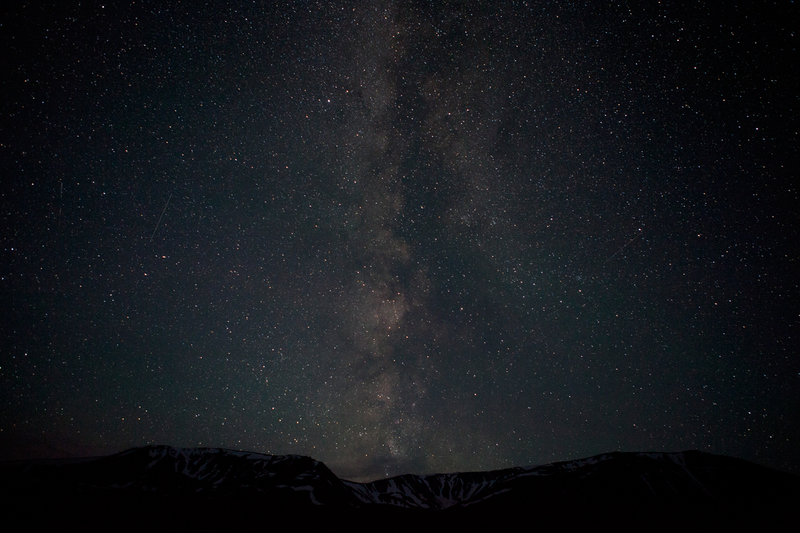 Also, it looks like I will have clear skies tonight so I’m setting an alarm for 12:15am to do some photography. I’ll write a little then to kill some time… So, 12:15 was too early, the 3/4 moon was simply too bright but pretty. 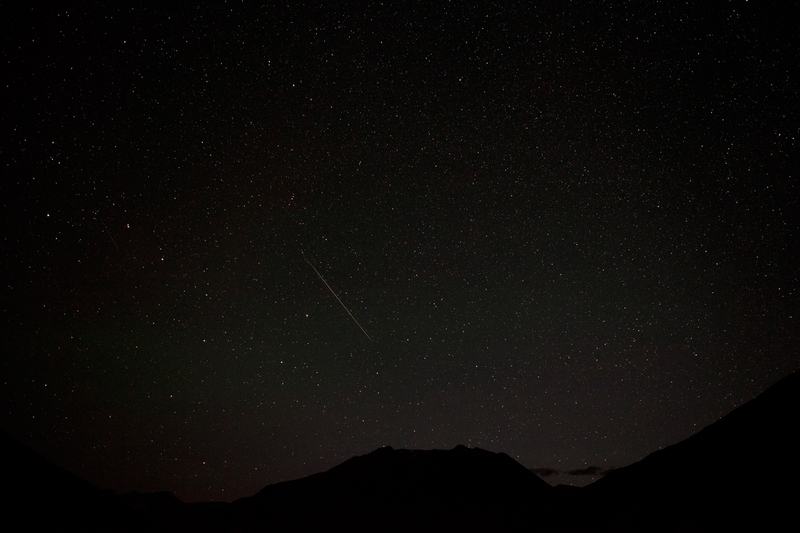 I woke at 2:45 and have a few test shots done with the Big Dipper in the frame. Now I wait for the CF card to fill up. The Big Dipper looks huge! 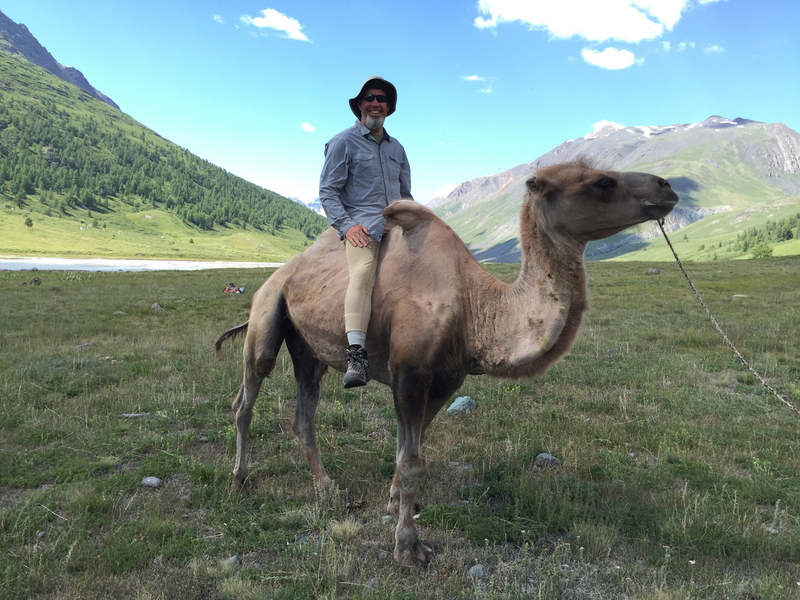 Day 6 – Friday, July 15, 2016: Today was a tough day for the horses and camels. We had to climb over 3,000 ft. to our highest point at 10,324 ft. We have come back down to camp around 8,600 ft. This campsite is… mushy and lumpy. And as we crawl in our tents after dinner it is raining lightly. I’m hopeful we’ll wake up to a sunny morning. I had our mileage today at 11.4 miles. My middle back is a tad sore but my inner thighs are doing great. We have 4 more days of riding to go! Oh, at the end of dinner Tomas and I had a herd of rams stampede our tents. Mine survived, his rain fly got ripped. Tusker put the spare on and Tomas is good to go. View at the beginning of our biggest day with the first climb towards the right. 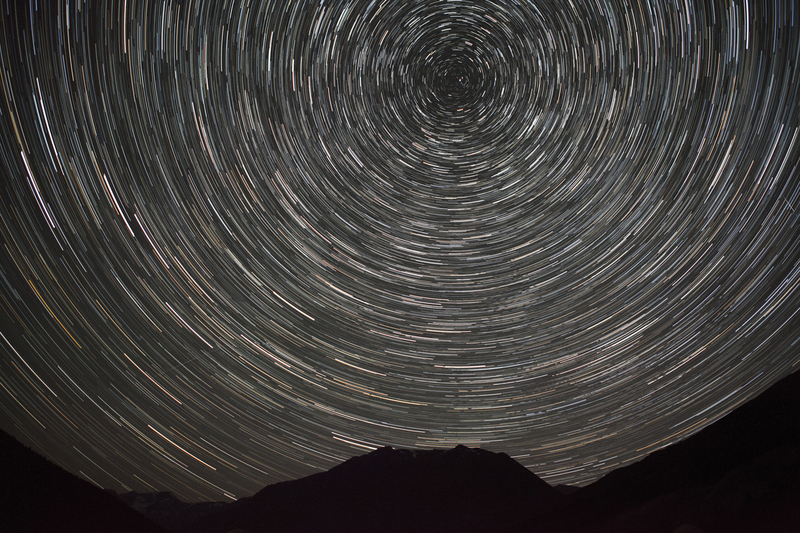 These are also the same mountains at the bottom of the Big Dipper star photography. Trail down from the highest point of the trip at 10,384 ft. This was the only place we were not allowed to ride the horses; it was very steep! Day 7 – Saturday, July 16, 2016: Neat day today with mixed weather. We stopped and saw the inside of a Tuvan ger which had shorter ceiling but was otherwise similar to the Kazakh ger. This family had a pet cat; which was very cute but I found strange for how remote we are. 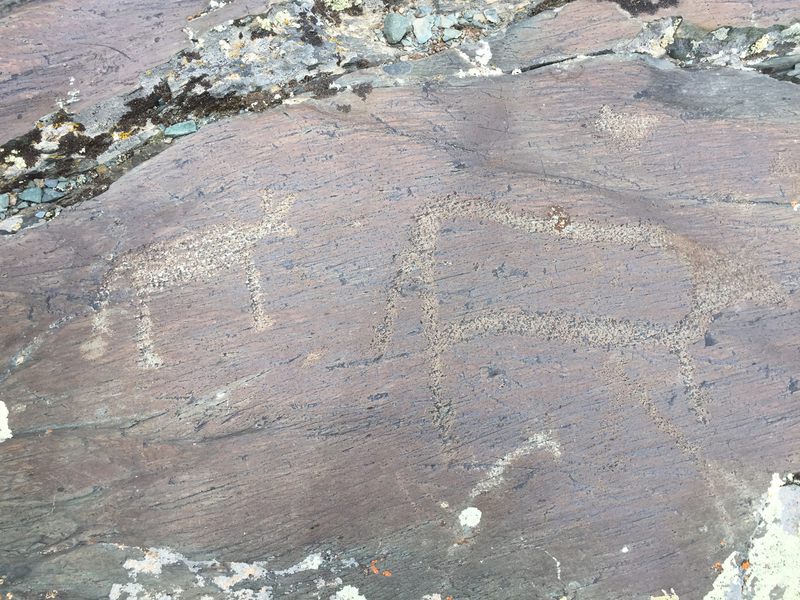 As the ride continued we stopped at a UNESCO site full of old petroglyphs. We ate lunch here as well. As we began riding again a very cold rain and wind set in. I think I noticed a little sleet mixed in. Finally the rain quit and we made it to camp. We rode 11 miles today. Camp is flat and we’ll be here 2 nights. We have had little rain sprinkles on and off but also good sun. This morning in the swamp camp I soaked one of my sneakers. I dried in the sun and is good for wearing around camp. On the way into camp we got our first far away view of the large glacier we’ll be near in a couple nights. Day 8 – Sunday, July 17, 2016: Today was a light day, essentially a rest day and a 2nd night at XXXX camp. We went on a less than 5 mile ride up 800 ft. to a turquoise lake above the valley. I tried to get my horse into a full gallop for video but he wouldn’t quite get there. 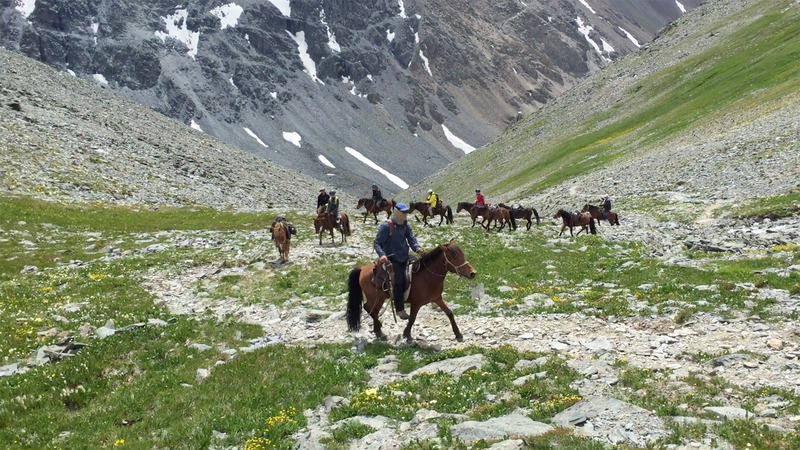 I’ve had him at full gallop twice on the trek… once after the first burial catching up to the group and once in the last field before the mountain trail. I did get a good video of his gait, cantor and light gallop. Hopefully I’ll have another opportunity to catch the full gallop on video. It was much cooler at this camp; windy too. 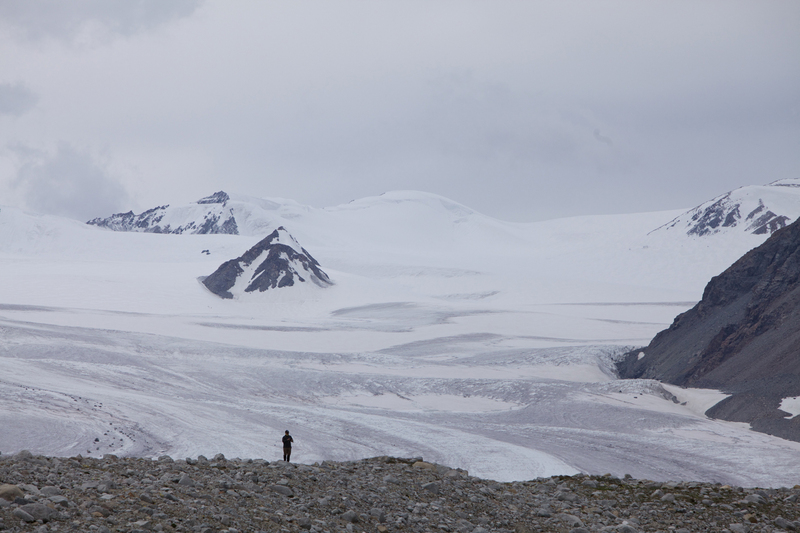 We go close to the large glacier tomorrow so I expect it will be cooler still. I’ll wear a better base layer in case. I’m thinking of all my new friends at the barn… Jill, Melanie, Amanda, Nicole, Jamie, Sammie, Justin, Krystal and all the wonderful horses I was able to ride training for the trip: Cocoa, Peanut, Tucker, Cisco, Diva, Rose, General, Duster and Zanny (Zayne who I’ve never ridden) and the 2 in WY, War Chick and Radiance. What an amazing year you have helped make possible for me. Also a big hello to my rock climbing buddies… I’ve missed a lot of climbing these past 6 weeks (WY, CO, Mongolia) and I can’t wait to get back on the wall. So, it’s 10pm, the sky is still light and I’m not really sleepy but there isn’t much left to do today, good night! Day 9 – Monday, July 18, 2016: Today was another day over 11 miles. 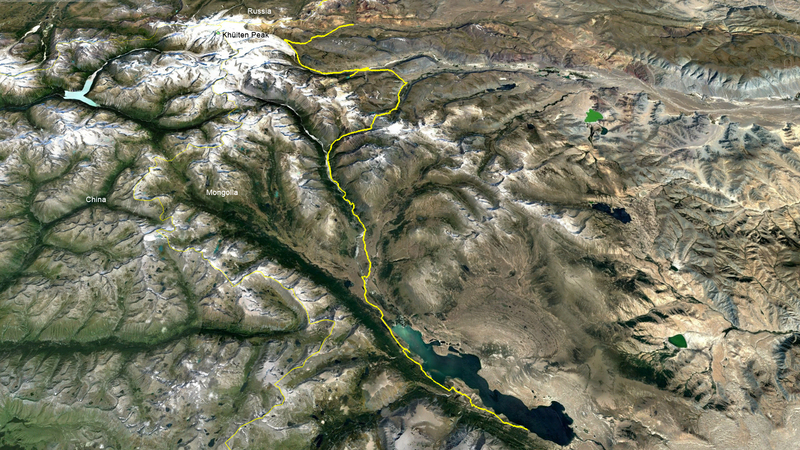 We also gained 2000 ft. and are sleeping at 10,080 ft. next to the moraine of the Alexander and Pontaniin Glaciers. We can also see the highest point in Mongolia, a summit over 14,000 ft. as well as the point which marks the Chinese, Russian and Mongolian borders. As a special treat the guides gave us smoked salmon and a light martini bar. It is fairly cold at this camp. It took a while for me to warn up my 20F sleeping bag last night so I may need to use my liner or long johns. This is the last camping night. Tomorrow we ride out to the ranger station, lunch, the Land Cruisers back to the ger camp. 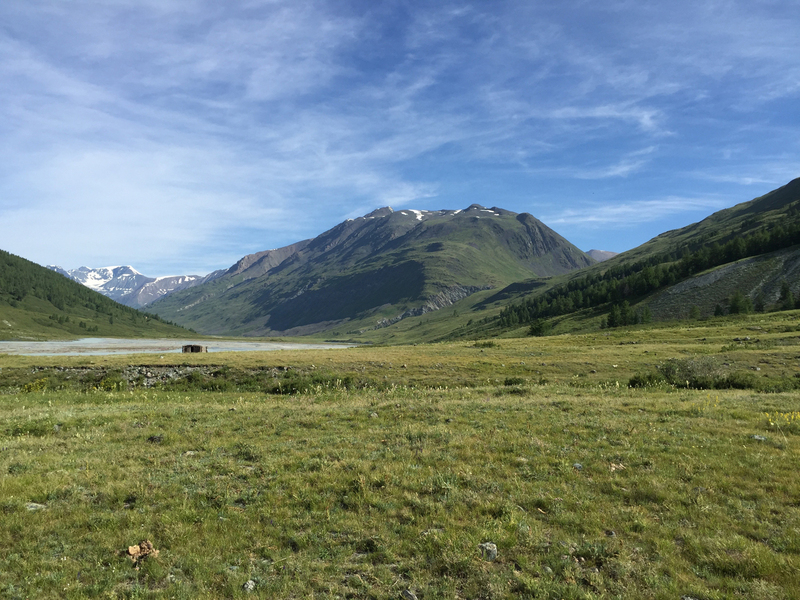 This has been an incredible experience to the Altai Tavan Bogd National Park; a place which sees only 1500 visitors each year. I’m looking forward to civilization and a shower… and a coke and a beer. 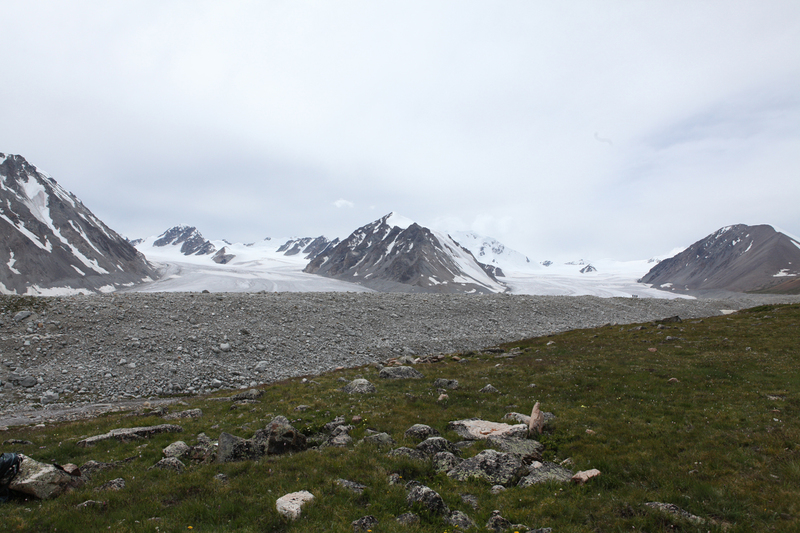 Above the Potaniin Glacier, the solid white mound at top center is the border of China, Russia and Mongolia. Day 10 – Tuesday, July 19, 2016: What a phenomenal day and great trip. 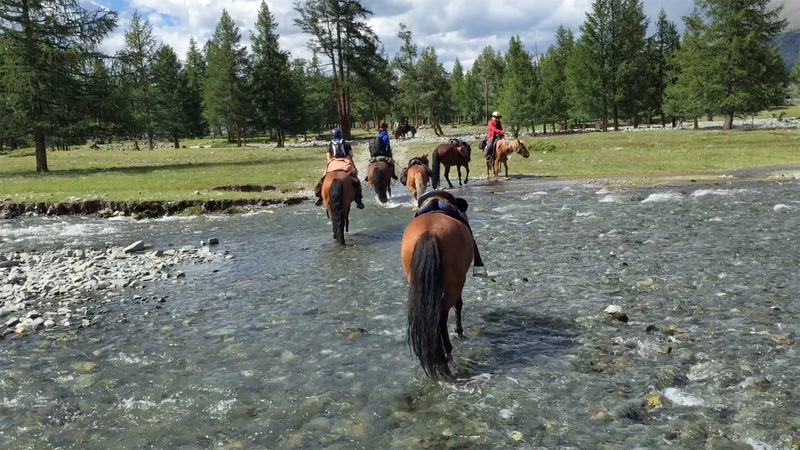 I made my goal today for proof of the full gallop in Mongolia and it was awesome! Dosjan took the video as he galloped along side. There were 2 others times when I reached this speed… 1) was the open field catching up to the herd after stopping at the burial mound and 2) was in the open field before the coral where we began our walk through the steep mountains. This gallop was awesome. While I have a couple cool star shots, this video takes the cake! After the 1/2 day ride we loaded back up on the Land Cruisers for the 100 mile 4×4 ride back to Ulgii. We’re sleeping in the ger camp tonight with a super early morning, long drive and flight to UB. We’ll get a real shower there before being drug back to the airport for our flights home.